Anyone who has taught middle school English can tell you this is hard to do. I’ve tried many approaches over the years, but the most effective one, by far, was this year’s experiment: asking students to create their own garments for specific characters in Macbeth. By the end of the play, one pattern we had talked a lot about is how clothing is described in metaphorical terms. For example, after Macbeth murders the king and takes over the throne, one character says that Macbeth “[feels] his title / Hang loose upon him, like a giant’s robe / Upon a dwarfish thief” (5.2.20-22). Metaphors like this resonated with my students because they’re rooted in physicality: the way clothing fits on a person. I had this idea in mind when I caught a glimpse of a few sewing machines in our school’s Makerspace. I contacted the director of our Makerspace, and together we envisioned a way for students to actually make metaphors. 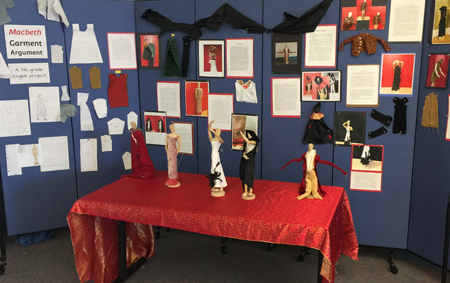 We decided to have each student in my class design and sew a garment for a single character in Macbeth—one that would fit on a 16-inch artist’s mannequin. The garments would serve as visual arguments for how students believed their characters should be interpreted. We immediately ordered a few cheap artist mannequins from Amazon. Then, we amassed a fabric collection by asking students to scrounge at home and teachers to procure scraps from their supply closets. Our Makerspace director printed copies of a doll clothing pattern she found online—one that could easily be modified to suit students’ needs. Over the course of two weeks, my class met in our Makerspace. An art teacher joined for a few classes and helped our Makerspace director teach students how to sew by hand and with the machines. Meanwhile, I went around and conferenced with students one-on-one about their ongoing writing assignment: a one-page explanation of their visual arguments. The essay, which they drafted for homework, needed to articulate a central argument about the character and use quotations from the text to support the garment’s design. They also had to dress a 16-inch artist’s mannequin in the garments they created and manipulate the mannequin’s head, arms, and legs into a position that reinforced what they were trying to argue with their garment’s design. For example, if a student argued that Lady Macbeth is a prisoner in her own marriage, he or she might lower the mannequin's head and move its hands behind its back, as if it were handcuffed. Then, the dressed and manipulated mannequin was photographed. For the entirety of this project, the atmosphere in the Makerspace was collaborative, energetic, and fun. Students moved around the room to retrieve materials and see each other’s works-in-progress. Once a student learned how to sew, he or she assisted the others with their garments. Macbeth reaches too far by stealing the crown and becomes enslaved by it, and because of his lack of control, he kills indiscriminately. Lady Macbeth is the true leader in her relationship with Macbeth because she has a warrior’s mindset. Finally, to share their stellar work, students created a display at the back of our school’s cafeteria. On a mobile display board, they hung printed photos of their work alongside their one-page essays. Below the board, they set up a table with the garments themselves. The school community enjoyed seeing this creative work, and my students were proud to share it. Aside from a way to make learning physical, the whole project was really an exercise in creativity. I know that’s why it worked so well. If we are to teach students how to write analysis, then we need to give them time and space to be creative. When given opportunities to bring the text to life—to make something from the words—they see things they wouldn’t be able to see otherwise. And that’s the kind of fresh vision that makes studying literature worthwhile. That’s when their analysis moves beyond one-size fits all. Ryan Tahmaseb teaches at The Meadowbrook School in Weston, Massachusetts. His writing has appeared in Education Week, Independent Teacher, and Spartan Literary. His first chapbook, Mutual Incomprehension, was published by Anchor & Plume Press in January 2016. You can find him online.